16 августа 1984г. : первый полет турбовинтового транспортного самолета ATR 42 (F-WEGA), созданного фирмами "Aerospatiale" и "Aeritalia". The three Aerospatiale/Aeritalia ATR 42 regional airliners that have been used for the flight development and certification programme which was completed on 24 September 1985. Seen recently at Cayo Largo is the first ATR42-300 (CU-T1451) for Aerogaviota, the Cuban airline which is introducing the type to replace its fleet of 19 An-26s. Местное воздушное сообщение между островами Новой Каледонии обеспечивает авиакомпания "Air Caledonie", имеющая в своем парке один ATR 42-500 и два более вместительных ATR 72-500. Все три самолета несут аналогичную яркую окраску. Фирмы "Aerospatiale" и "Alenia" занимаются высокотехнологичными разработками. Поэтому в базовый проект ATR 42 внесен ряд серьезных новшеств. Однако при этом удалось избежать чрезмерной сложности с учетом нацеленности этого самолета на рынок, требовавший скорее неприхотливой рабочей лошадки, нежели капризного породистого скакуна. 3 декабря 1985г. : французская авиакомпания "Air Littoral" получила первый серийный ATR42, в производстве находится четвертая машина. Самолет полетел 30 апреля, сертификацию FAA прошел 25 октября. A popular tourist destination in Malawi is Club Macakola on the shore of Lake Malawi. Here, the ATR 42 7Q-YKQ taxies in from the evening flight from Chileka. 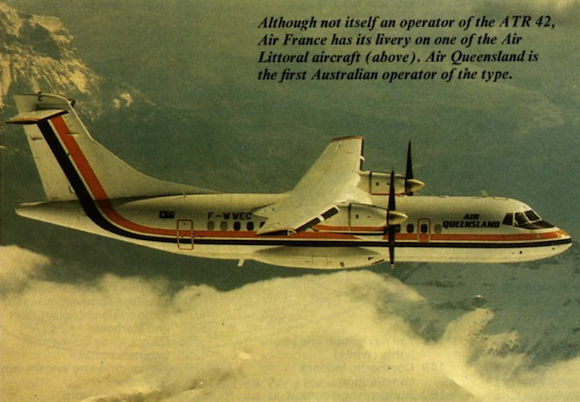 Air Queensland is the first Australian operator of the type. Departing runway 06R at Palma de Mallorca on June 16, 2014, Aero Nova ATR 42-320 EC-IDG (msn 003, ex F-WQNE) is based at Burgos-Villafria in northern Spain for the summer season for charter flights to Mediterranean destinations including Alicante, Malaga and the Balearic Islands. It has special titles (‘Burgos origen y destino’ - Burgos origin and destination) on its forward fuselage for the duration. 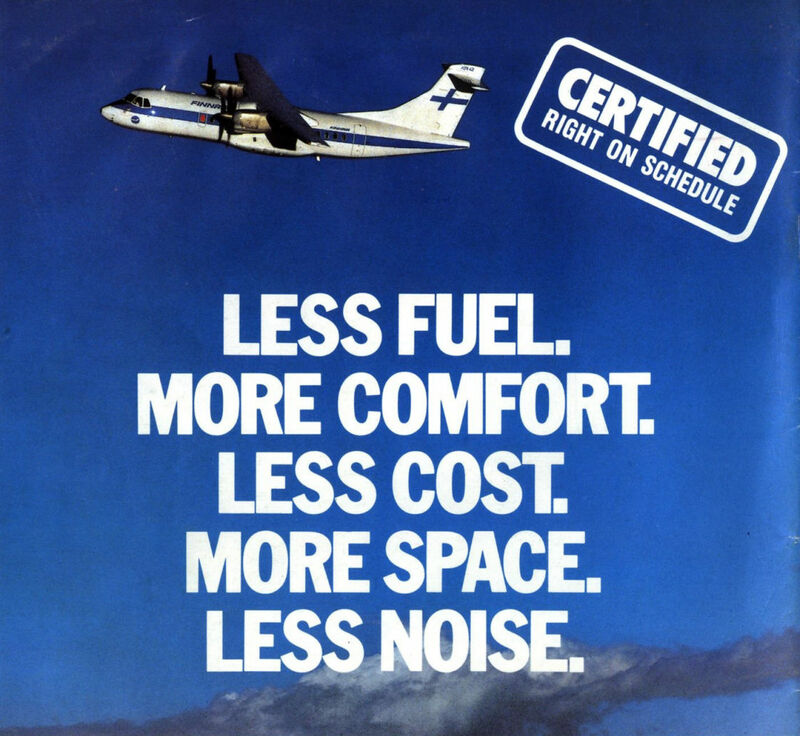 The turboprop is the oldest active ATR, having first flown on April 30, 1985. The ATR turboprop, in both its lengthened -72 and shorter -42 (shown) versions, forms the backbone of Eurowings’ fleet. However, the airline recognises that the future is with jets and a replacement for the ATR72s is urgently being sought. Among the 15 airlines operating the regional transport were Holland Aerolines, flying on regional routes to and from cities in the Netherlands. 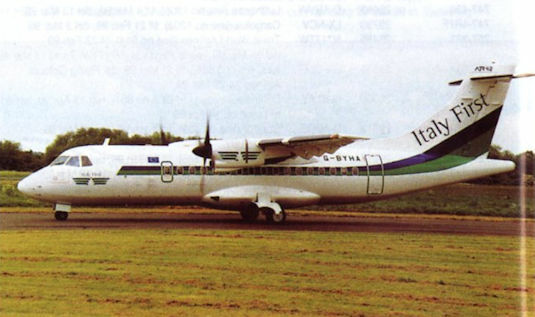 The two former Thai ATR-42s G-BYHA and G-BYHB were due to be delivered to the new Italian airline Italy First after completion of preparatory work by JEA Engineering at Exeter. On February 12, 2013, the sole ATR 42-600 ordered by Jhonlin Air Transport (JAT) of Indonesia was delivered. The turboprop (PK-JBA, c/n 1004, ex F-WWU) is seen conducting a test flight from Toulouse in southern France prior to hand-over. JAT began operations in November 2011 using Cessna 208 Caravans. До банкротства компании "Pan Am" в ее цветах на региональных и ближних рейсах летали шесть лайнеров ATR42. Этот самолет был сфотографирован над Тулузой перед его поставкой и, хотя на нем уже нанесены эмблемы компании "Pan Am", ему пока присвоен французский испытательный регистрационный номер. Berlin’s famous Tempelhof terminal forms the backdrop to one of RFG’s ATR42s in May 1996. ATR 42-600 F-WWLX (msn 1015) - delivered to TransNusa Aviation Mandiri of Indonesia as PK-TNJ on September 29, 2014 - on test at Toulouse-Blagnac in southern France on September 22, a week after its first flight. 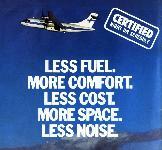 TransNusa ordered a single ATR 42-600 and placed options for a further three in 2013. The airliner is based at El Tari Airport in Kupang and is expected to begin operating revenue earning flights in November. Around 100 ex-passenger ATRs have now been converted to freighters, with FedEx one of the operators. 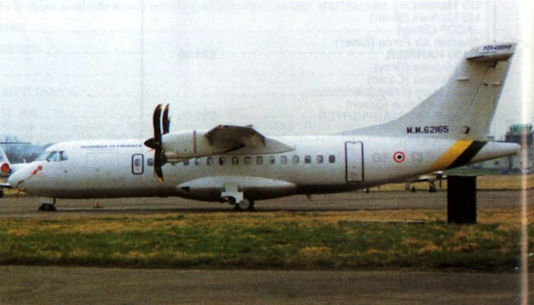 MM62165/GF13, c/n 500, one of two ATR-400MP maritime patrol aircraft operated by the Italian Government's Guardia di Finanza or customs service, visited Dublin and Edinburgh on 10/3/99. Проект ATR 42 не просто авиалайнер - он также несет военную и пограничную службу. 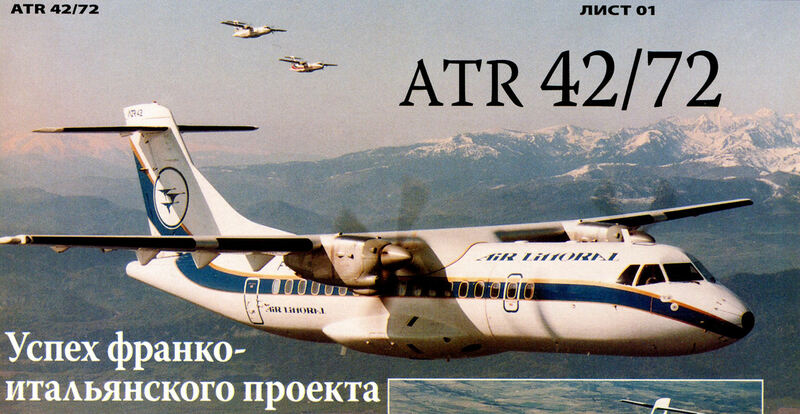 Самолеты версии ATR 42MP используются в береговой охране Италии. В версии ATR 72 существенно удлинили фюзеляж для размещения еще 30 пассажиров. Для этого, в свою очередь, потребовались форсированные двигатели, больший размах крыла и усиленное шасси для дополнительной массы. 27 октября 1988г. : первый полет в Тулузе, Франция, выполнил ATR72 - удлиненный вариант ATR42. On April 29, 2013, Aer Arann received ATR 72-600 EI-FAS (msn 1083, ex F-WWET), named St Connell, during a ceremony at the manufacturer's facility at Toulouse Blagnac in southern France. It first flew on April 18 and arrived at Dublin Airport, Ireland, on May 3. 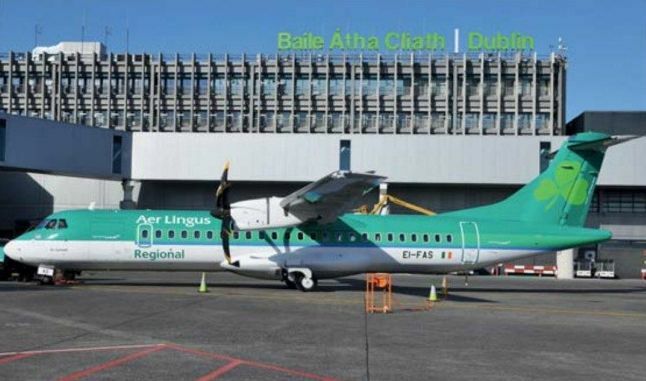 The regional airliner entered service on Aer Lingus Regional routes the following day, flying between Dublin and Edinburgh in Scotland. 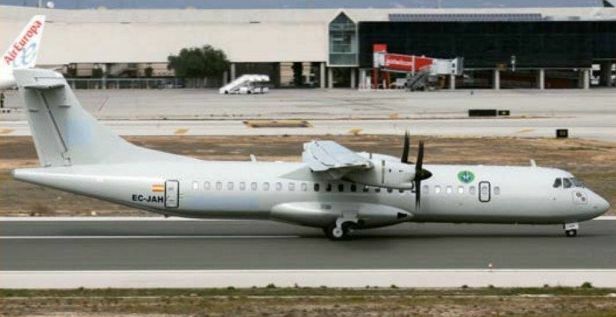 Aer Arann ordered eight of the new-generation ATR 72s in July 2012, all of which will be delivered over the next 11 months. Mount Cook Airlines operates this ATR72-600, ZK-MVA (msn 1051), for the Air New Zealand Link operation. Rebranded flag carrier Air Serbia (formerly Jat Airways, retaining the JU code) has introduced ATR 72-202 YU-ALO (msn 186) into revenue service with a new interior incorporating 66 leather seats and a new livery. 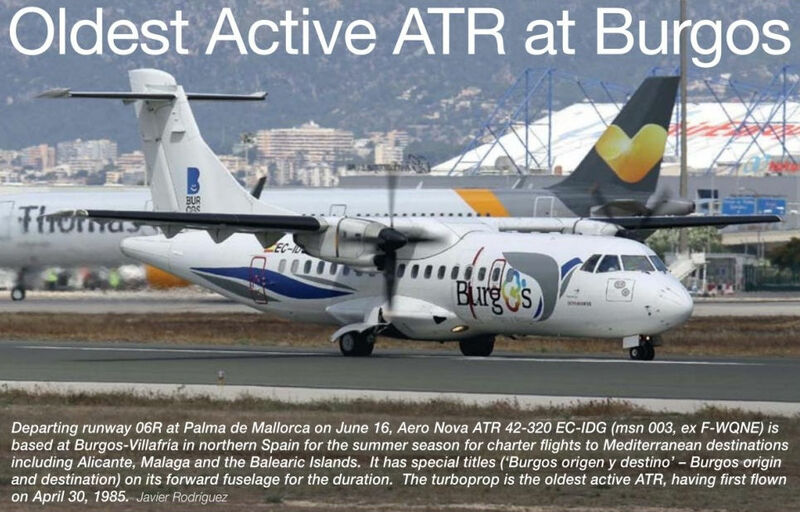 The other three ATR 72-202s and two -500s (212As) will also be upgraded and rebranded. To date, Air Serbia has taken delivery of five Airbus A319s, and its first 164-seat A320 (Dash 232 msn 2587, currently VH-VQO) has also been leased and received the carrier’s livery. It will have a new interior installed before entering service. Air Serbia, 49% owned by Etihad, ordered ten A320neos during the Dubai Airshow in November 2013. Компания "American Eagle" предоставляет услуги региональных перевозок по всей территории США. Одно время она эксплуатировала больше всех в мире лайнеров ATR серии 42/72 - 46 машин ATR 42-300 и 47 самолетов ATR 72-200, -210 и -210A. Сегодня в этой компании летают 39 ATR 72-200. ATR 72-600 F-WWEC (msn 1114) conducting a test flight at Toulouse-Blagnac in France on October 23, 2013. The regional airliner was delivered to Avianca of Colombia as HK-4955 on November 2, the second of three on order. The third (HK-4956, msn 1116, ex F-WWEE) was handed over five days later. The first ATR 72-600 registered in Honduras (HR-AYJ, msn 1172, ex F-WWEM) arrived at Toncontin International Airport, outside the national capital, on August 26, 2014. 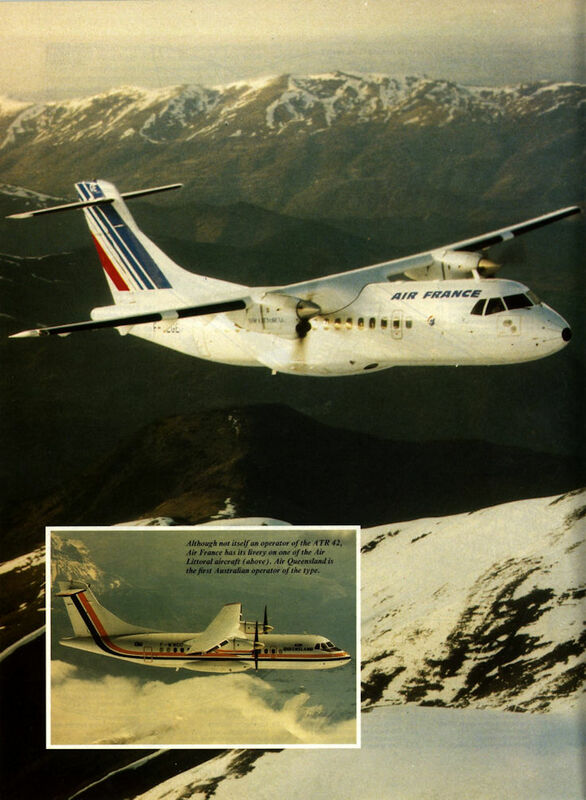 The turboprop regional airliner was on delivery to Avianca, having arrived from the manufacturer’s facility at Toulouse in southern France with just 35 flight hours. 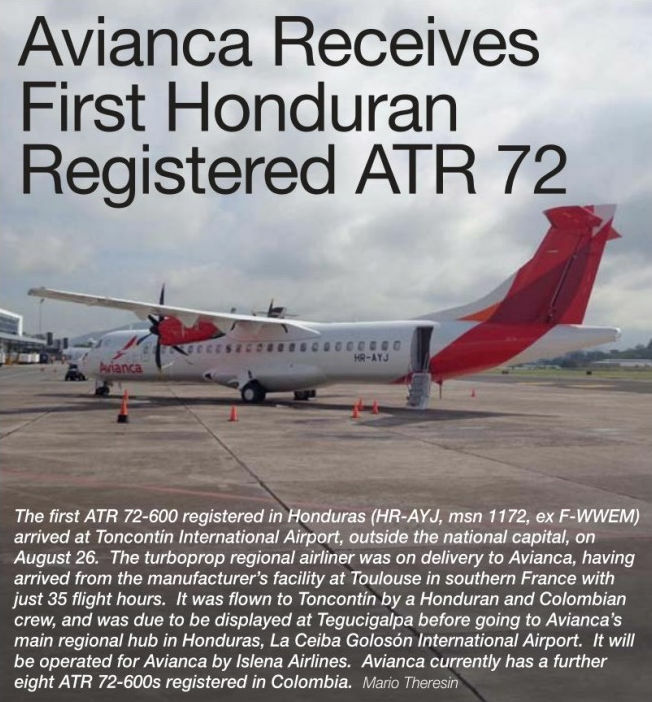 It was flown to Toncontin by a Honduran and Colombian crew, and was due to be displayed at Tegucigalpa before going to Avianca's main regional hub in Honduras, La Ceiba Goloson International Airport. It will be operated for Avianca by Islena Airlines. 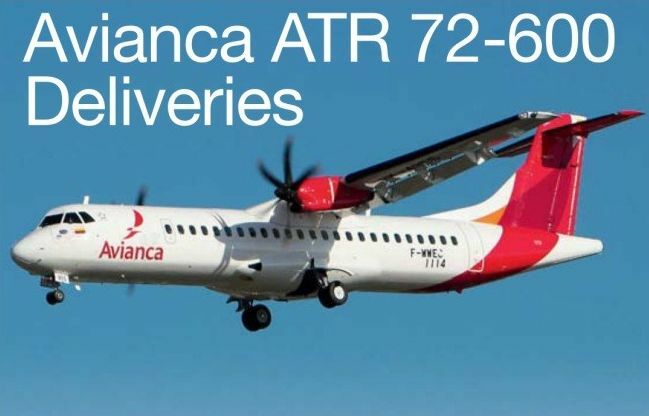 Avianca currently has a further eight ATR 72-600s registered in Colombia. На этом снимке эффектно смотрится лайнер компании "Binter"- серийный вариант проекта -72 серии 500. Самые новые машины этой серии обрели возможности по Категории II ИКАО, означающие, что они могут безопасно садиться в очень плохих метеоусловиях. The ATR turboprop, in both its lengthened -72 (shown) and shorter -42 versions, forms the backbone of Eurowings’ fleet. 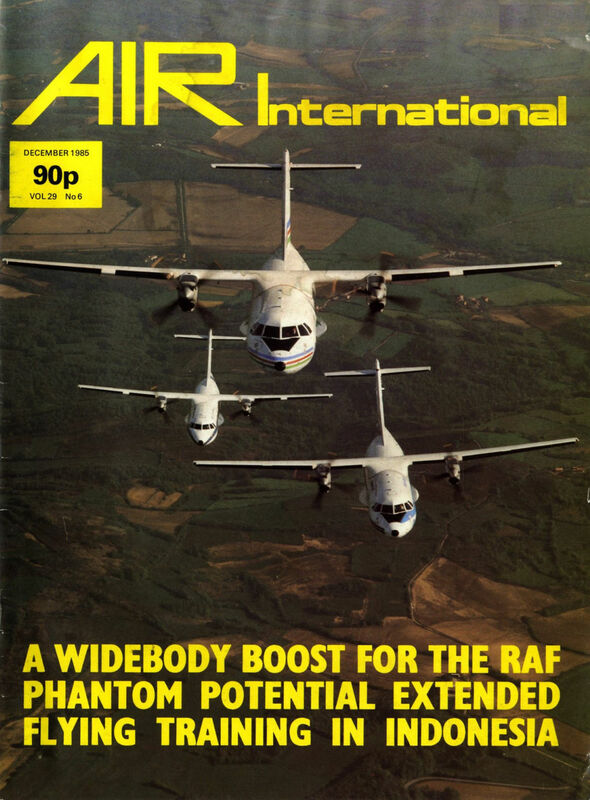 However, the airline recognises that the future is with jets and a replacement for the ATR72s is urgently being sought. 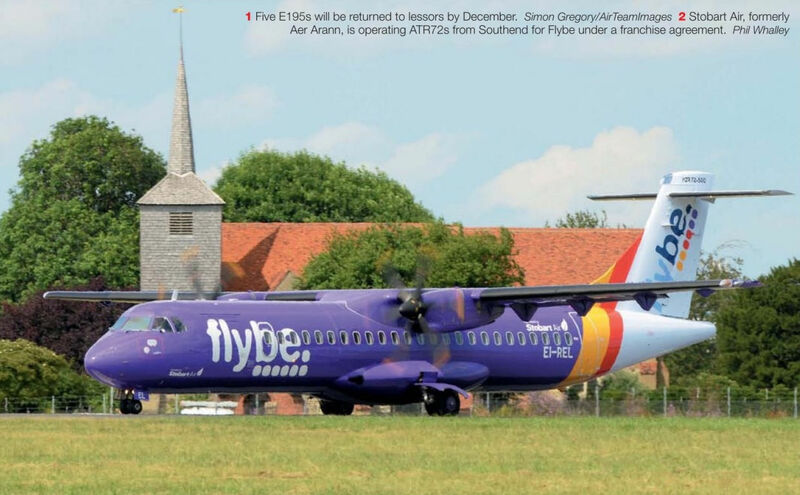 Stobart Air, formerly Aer Arann, is operating ATR72s from Southend for Flybe under a franchise agreement. 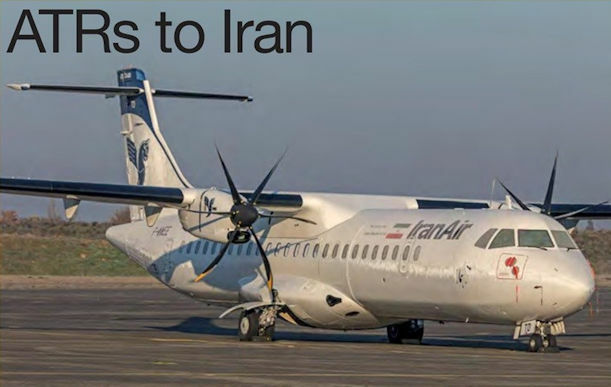 Forty ATR 72-600s have been ordered by the Iranian Government for Iran Air as part of a slew of orders for western airliners following the easing of sanctions. 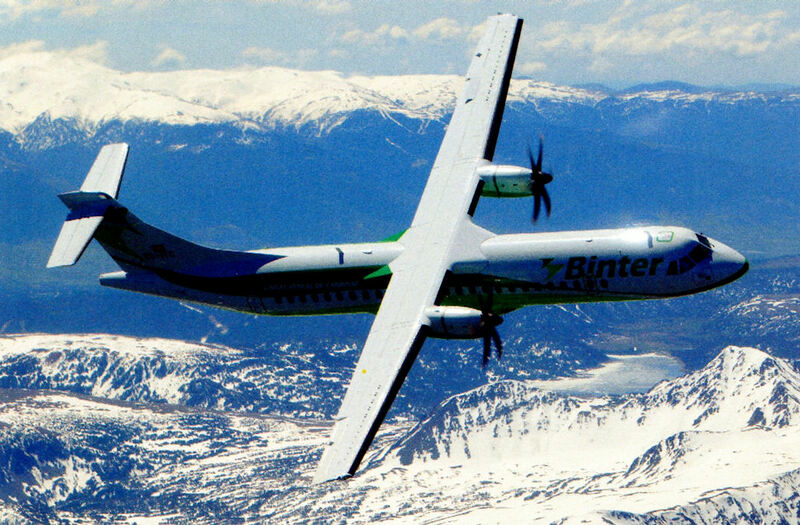 Индийская авиакомпания "Kingfisher Airlines" использует ATR 72-500 на линиях внутри страны. Первый из 35 заказанных самолетов (на снимке) был поставлен компании 30 марта 2006 года. An ATR 72-600 destined for Leeward Islands Air Transport (LIAT) of Antigua and Barbuda is undertaking flight tests at Toulouse-Blagnac in southern France. The aircraft (F-WWEN, msn 1077) is seen on approach at the airfield on June 4, 2013. It first flew on May 7 and will become V2-LIA upon delivery. UAT's order for three ATR 42-600s, plus options for a pair of ATR 72-600s was announced in January, with deliveries due to start in June. 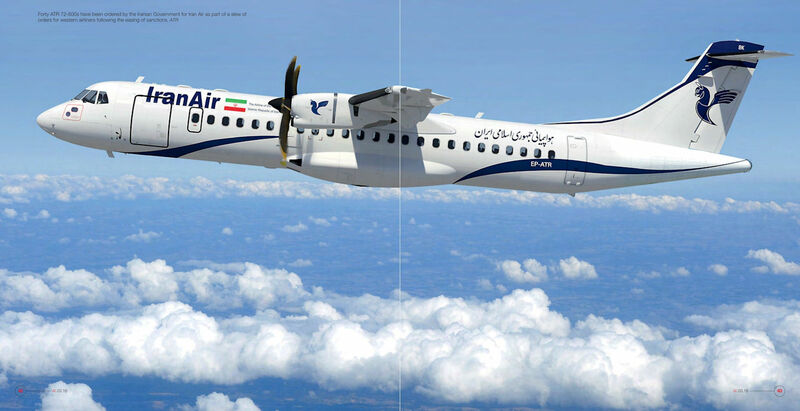 However, V2-LIA is the first of two ATR 72-600s for the company, owned by the Air Lease Corporation, scheduled to be delivered in June and August. 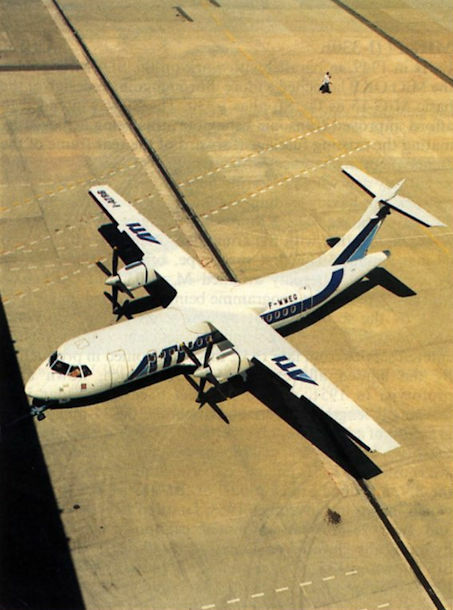 Ordered before the ILG collapse, ATR72 D-ANFA was the first of its type to be introduced into service. 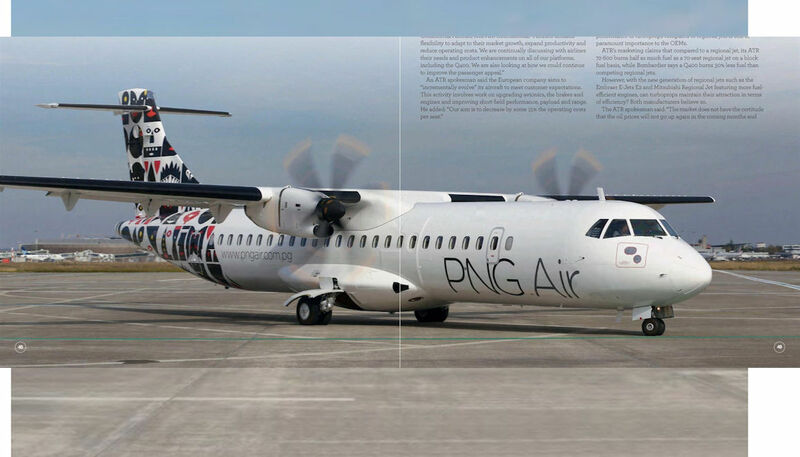 The Cargo Flex option on the ATR 72-600 was first delivered to PNG Air in Papua New Guinea late in 2015. Sales of ATRs have increased in recent years. This ATR 72-600, G-FBXC (msn 1300), is operated by the UK airline Flybe as part of a franchise agreement with Scandinavian Airlines. Former Aer Arann ATR 72-500 EI-REP (msn 797, ex F-WWEZ) arrived at Dublin Airport in Ireland on June 26, 2013 after being repainted in Yangon Airways' colours at Dinard in France. The Myanmar-based airline already operates two ATR 72-212s and will take delivery of this example imminently. 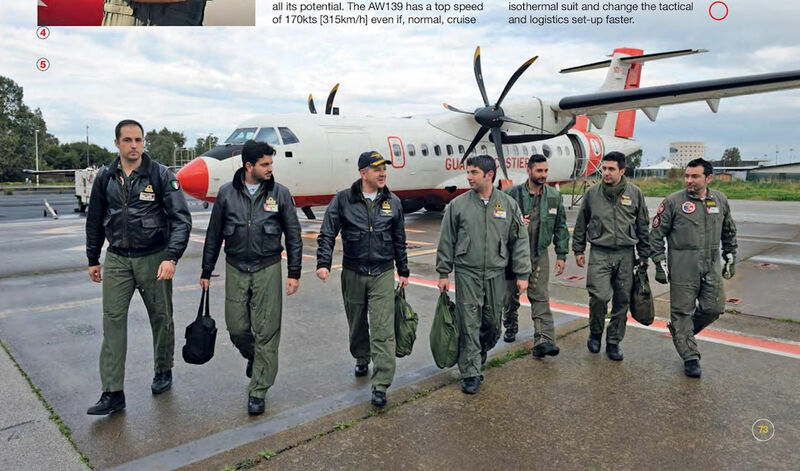 Pakistan Naval Aviation has received a second ATR 72-500. Former Air Botswana airliner A2-ABS (msn 788, ex F-WWEG) was refurbished at Las Palmas on Gran Canaria and departed on its delivery flight to Pakistan via Palma de Mallorca on July 8, 2013. The first example was handed over to Pakistan in March. 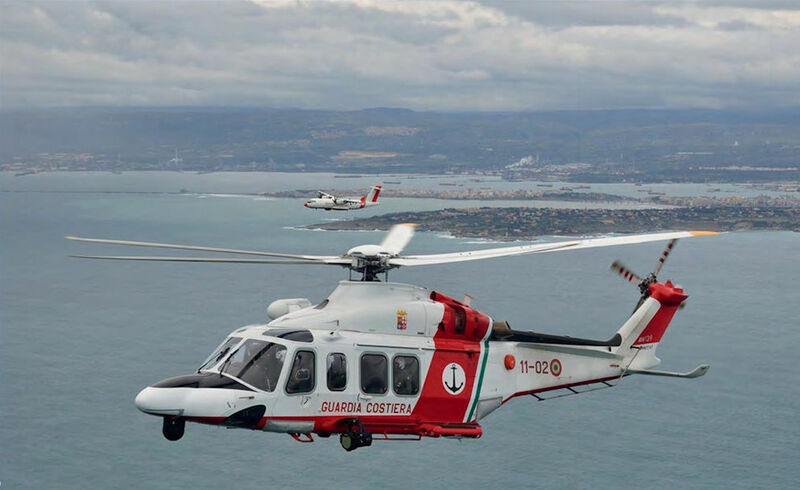 Both will be used for pilot training and as utility transports with a mixed freight and passenger configuration. Passing through Palma de Mallorca on March 2, 2013 was ATR 72-212A EC-JAH (msn 712, ex F-WWEL) on its delivery flight to the Pakistan Navy. The aircraft is in a mixed passenger and freight configuration acquired, via a tender issued on October 31, 2012, by Pakistan Naval Aviation for pilot training and utility tasks. 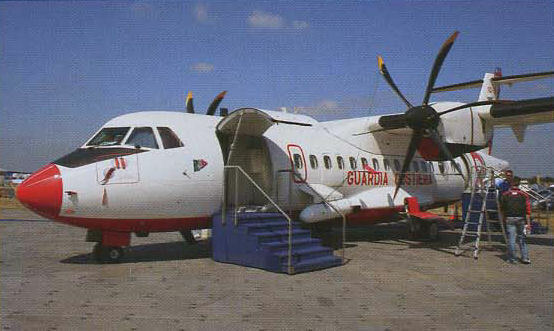 Naysa operated the aircraft previously in Binter Canarias colours. It departed Palma de Mallorca 50 minutes later for Turkey's Antalya Airport on its journey to Karachi in Pakistan. ATR 72-600 TMUA T.C.B.701, wearing the test serial CSX62290, landing at Torino-Caselle in Italy at the conclusion of a test flight on July 1, 2013. It is expected to be delivered soon. 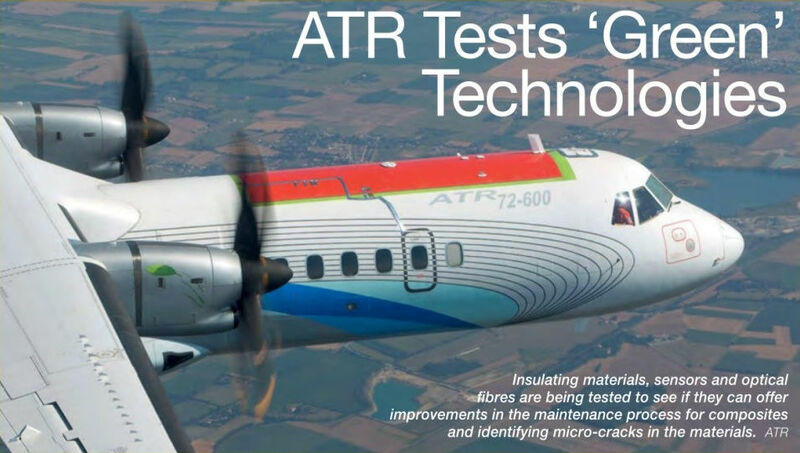 ATR 72-600 F-WWEY is flying as part of ATR's All Electric Aircraft trials. Insulating materials, sensors and optical fibres are being tested to see if they can offer improvements in the maintenance process for composites and identifying micro-cracks in the material. ATR-72-202F freighter HB-AFH (msn 313, ex VT-FQA) of Farnair Switzerland on the apron at Eindhoven Airport in the Netherlands on October 1, 2013. The aircraft is the first to be painted in DHL’s distinctive yellow scheme for operation on behalf of the package distribution company. It departed Eindhoven for EuroAirport Basel Mulhouse Freiburg in France to begin operations for the freight company carrying mail for the Swiss postal service. Delivery of the first ATR 72-600 Turkish Maritime Patrol Aircraft is expected in the first half of 2017, with deliveries of the five remaining aircraft completed during 2018. 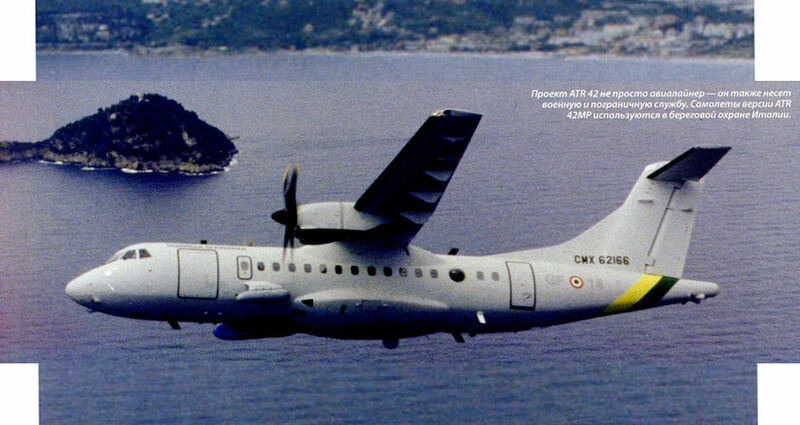 The first of four ATR 72MP maritime patrol aircraft on order for the Italian Air Force, C.S.X62279, test flying on December 23, 2014 from Turin-Caselle Airport, Italy, still only painted in primer. 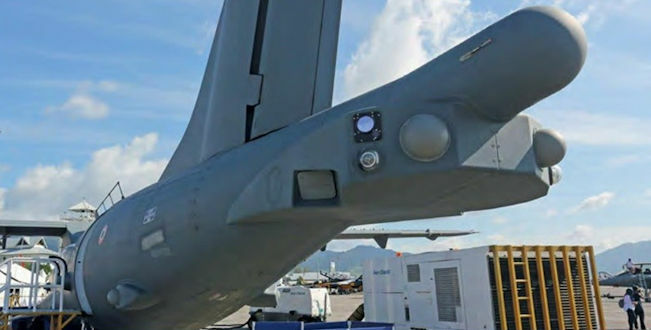 The extensive array of aerials and sensor housings on the aircraft is clearly apparent. P-72 CSX62279 seen on a test flight from Verona airport. Note the installation of a high-powered search light near the starboard side nose. Numerous sensors including the Selex Seaspray 7000 radar can be seen on this side profile. An extension to the aft fuselage houses the electronic support measures system and mounts for a future magnetic anomaly detector boom.